Situated at the western shores of the Hvar Island, Stari Grad is among the oldest European cities. Built in ancient times, it occupies a natural harbor with houses and streets spreading at both sides of this deep bay. Stari Grad is a historical core of the island with its numerous archaeological findings, valuable monuments and sights. But, this settlement is also a beloved tourist destination with a wide range of services, activities and accommodation options. It is believed that the area of Stari Grad has been inhabited since the early prehistoric times; there are archaeological findings confirming the existence of the so-called “Hvar Culture”. The city gained its urban form in 4th century BC when Greek colonists inhabited the area naming it Pharos after their home island. 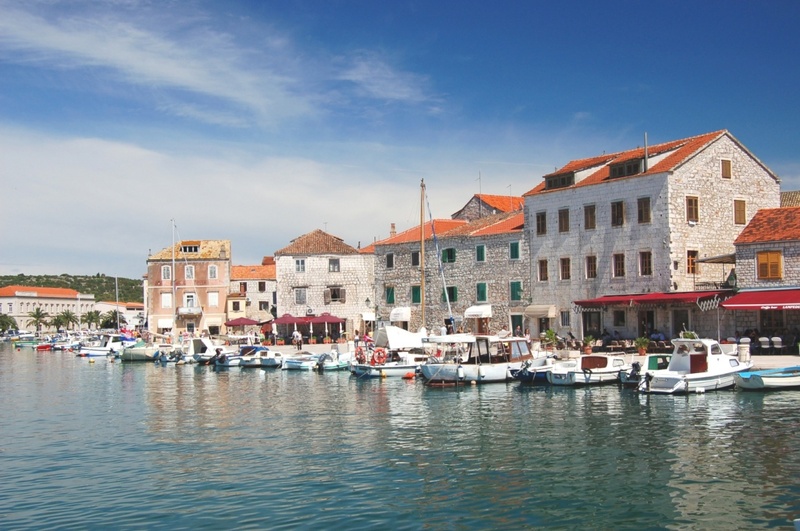 Stari Grad had been the center of the island up until the 13th century when Hvar city was founded. There are many sights to explore; from ancient Pharos remains and renaissance summerhouses to magnificent baroque churches. The Stari Grad Plain is the UNESCO protected agricultural area feeding the island inhabitants from the ancient times. It is covered with crops of olive trees, grape vine and lavender, but also with numerous archaeologically important localities. Visit the magnificent Tvrdalj, a renaissance summerhouse of Croatian writer Petar Hektorovic and explore local baroque churches (St. Nicholas, St. Stephen, St. Roko, etc.) and romantic squares (e.g. 17th century’s Skor). Apart from its rich cultural heritage, Stari Grad is beloved among the visitors for its beautiful beaches and impeccably clear sea. Lanterna is the most popular city beach approximately 800 m away from the center. It is covered with fine pebble and concrete blocks. The beach in front of Hotel Arkada is another popular bathing resort in a lovely pebble bay with nearby concrete blocks. Maslinica is a sand covered cove by the ferry dock. Banj is another city beach covered in fine pebble just 500 m away from the city center. Although Stari Grad cannot compete with the nightlife offer of Hvar City, it still offers various possibilities for night time entertainment. There are numerous cocktail bars with friendly staff serving some of the most delicious and creative cocktails in Dalmatia. Street performers often gather on city streets, squares and corners amusing their random audience. Open air concerts and theater performances take place under the starry summer sky. Fishermen’s nights are the central summer events filled with lots of joy, live music and excellent food. The lack of popular nightlife scene Stari Grad compensates with its praised restaurants and taverns where you can taste unique Dalmatian specialties along with excellent local wines. Stari Grad is easy to reach; just hop on the ferry in Split and within two hours you will be standing in the Stari Grad harbor. Ferry fare is between 7 and 35 Euros depending on how you're traveling (eventual car fare). There are numerous accommodation options in the city. It is very popular to choose among private accommodations, whether you stay in a small room or a luxurious villa. Many locals adapted traditional Dalmatian stone houses into desirable apartments for tourists that fusing the island’s tradition with the modern accommodation standards. Stari Grad has two hotels: Arkada and Lavanda; and three tourist settlements: Helios, Trim and Jurjevac. Find information about selected Hotels, apartments and rooms in Stari Grad to choose the perfect place for your accommodation. ©2019 - hvarcroatia.net All Rights Reserved.